Obamacare's Death Could Be Faster Than Republicans Intend : Shots - Health News Congressional leaders say they want a smooth transition from Obamacare. But insurance consultants say repealing the law before another plan is in place could jeopardize the insurance of millions. Senate Republicans will move "right after the first of the year" on a resolution to replace the Affordable Care Act, Senate Majority Leader Mitch McConnell told reporters Monday. Republicans in Congress say they'll vote to repeal much of the Affordable Care Act early next year — even though they don't yet have a plan to replace it. But they also insist that they don't want to harm any of the millions of people who got their health insurance under the law. The lawmakers' strategy? Vote to repeal, and fulfill their top campaign pledge. But delay the changes, and keep running Obamacare for as long as two years while they figure out how to fill the hole they'll create in the insurance market. 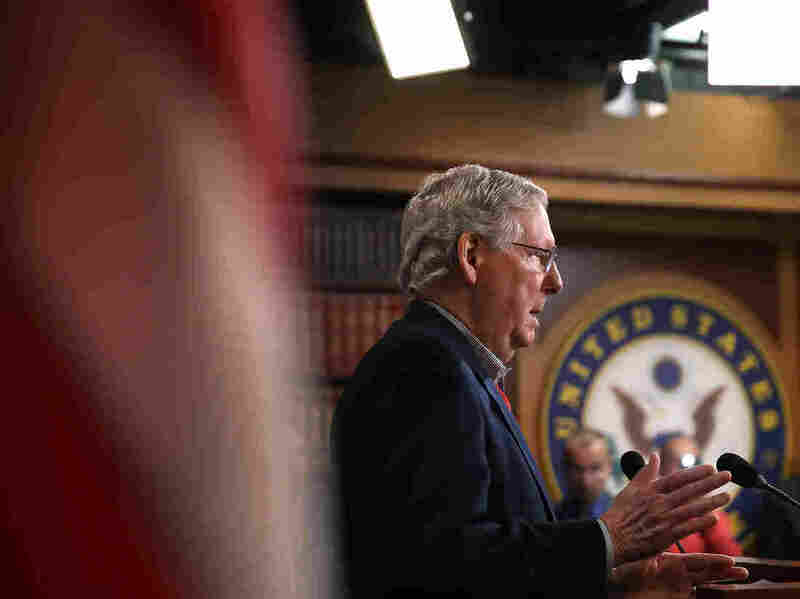 "We will move right after the first of the year on an Obamacare replacement resolution," Senate Majority Leader Mitch McConnell told reporters Monday, using terminology that refers to the type of vote lawmakers will take to defund the health care law. "Then we will work expeditiously to come up with a better proposal," he added. House Speaker Paul Ryan has said the plan will protect patients. "There needs to be a reasonable transition period so that people don't have the rug pulled out from under them," he told reporters at a news briefing at the U.S. Capitol last week. But repealing the law that essentially created an entire market for health insurance that didn't exist before — and then expecting that insurance market to remain healthy — may be fantasy, according to health insurance consultants. "I don't think the Republicans have come to grips yet that it's going to be their responsibility to keep the wheels on Obamacare," Robert Laszewski, president of Health Policy and Strategy Associates, told Shots. Republicans keep saying the Obamacare exchanges are collapsing, Laszewski said. But by voting to kill the law, they may actually speed up that process. "They're arguing that the thing is in death throes, that the insurance companies are losing tons of money and it's not sustainable," Laszewski said. "Why do they think the insurance companies are going to provide the insurance policies in that scenario?" An estimated 20 million people have obtained health insurance over the last three years via provisions in the Affordable Care Act. Some get coverage through the insurance exchanges, but millions are covered because of the expansion of Medicaid in most states, and because the law allows young adults to stay on their parents' insurance policies up to age 26. Laszewski isn't the only one who's skeptical of the "repeal but delay replacement" strategy. Last week America's Health Insurance Plans — the trade group that represents health insurance companies — circulated a memo on Capitol Hill warning that a sudden repeal of Obamacare could threaten the expanded health coverage for those millions. "Making sudden, significant changes now, or mid-year, will jeopardize the coverage they depend on," the letter said. AHIP asked lawmakers to keep in place many of the financial incentives that are central to the law — including the provision of subsidies for people to buy insurance and cover copayments, and the elimination of some taxes on insurers. The American Academy of Actuaries also weighed in, warning in its own letter that a repeal of the ACA without replacing it would be dangerous to the long-term health of the insurance market. "Insurers are in a situation right now where they're trying to determine whether or not they're going to participate in 2018," said Cori Uccello, a senior fellow at the American Academy of Actuaries. "And part of that depends on whether, in the long run, it makes sense for them to participate in the market. And that long run depends on what's going to happen, not just in 2018, but in the years after 2018." The big problem is that through Obamacare, the government plays a huge role in helping people pay for insurance on the individual market. Many insurance companies are already losing money on those policies, so if they think the government won't keep offering subsidies, insurers may just stop selling individual policies altogether. They won't necessarily wait to find out what Congress is hoping to do at some point in the future. Insurers "will have to see more than the repeal element," Shubham Singhal, head of the health care practice at McKinsey, who consults with health insurance companies, told Shots. "They'll have to see, if it's delayed, then what's the transition plan? That's going to be quite important for them, to understand whether it creates a stable marketplace or not." Another complication is that Republicans won't be able to repeal the law outright because — in order to pass a regular piece of legislation in the Senate — they would need the support of Democrats to overcome a filibuster. So they will have to use a special legislative maneuver that allows them to pass any bill related to taxes or the budget with a simple majority. That means lawmakers can defund Obamacare but leave some provisions in place, including a requirement that insurers cover people who have pre-existing medical conditions. Most experts believe having that requirement in place with no mandate for healthy people to buy insurance will lead companies to quit writing individual insurance policies altogether. So, even people who had insurance before the Affordable Care Act became law, and who pay for it without subsidies, could lose their coverage. "I don't think the Republicans are taking this anywhere seriously enough," Laszewski says. "They could get themselves into a real hole."